Web-camera from Míla is watching the eruption in Holuhraun. Please observe that Míla’s background photo has nothing to do with the current events. Scientists from the Icelandic Met Office and the Institute of Earth Sciences and representatives of the Civil Protection in Iceland attend the meetings of the Scientific Advisory Board of the Icelandic Civil Protection. Representative from The Environment Agency of Iceland and the Chief Epidemiologist and the Directorate of Health, were also present. 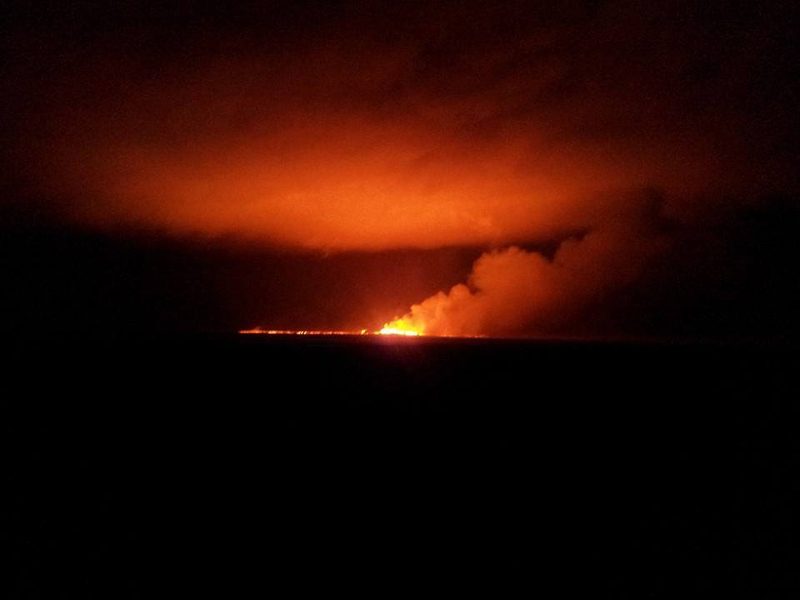 The eruptive activity at Holuhraun continues at similar intensity. Lava flows to the East at similar rates as yesterday. The lava is flowing in the river bed of Jökulsá á Fjöllum. No explosive activity due to the lava and river water interaction has been observed, but steam rises from the lava. Concentrations of SO2, comparable to those measured in the last few days, could increase slightly today in the east due to the direction of the wind. Efforts to increase gas monitoring in inhabited areas are ongoing. Data from The Environmental Agency SO2 monitoring stations in Reyjahlíð, Egilsstaðir and Reyðarfjörður are accessible on the web-site of the institute. Instructions from the office of the Chief Epidemiologist and The Environmental Agency can be found on their web-sites. Gas emissions at the eruption site remain high. As local gas concentrations at the site can be life threatening, people at the eruption site should wear gas masks and gas meters. Scientists on the site have had to leave the area repeatedly as concentrations of gas reached dangerous levels due to sudden changes in wind conditions. At the eruption site, local wind anomalies can occur due to thermal convection from the hot lava. This makes the conditions on site extremely dangerous as winds can change suddenly and unpredictably. Around 80 earthquakes have been recorded since midnight. The largest two earthquakes, M 5.5 and M 4.9 occurred on the northern rim of Bárðarbunga caldera. Low frequency tremor is similar to what has been observed in the last few days. GPS observations show insignificant crustal movements supporting the assumption that the amount of magma flowing into the dyke continues to be similar to the magma erupted to the surface. Large-scale subsidence of the caldera occurs, causing an eruption at the edge of the caldera. Such an eruption would melt large quantities of ice, leading to a major jökulhlaup. From the Icelandic Met Office: The Aviation Colour Code for Bárðarbunga remains at ‘orange’ and the code for Askja at ‘yellow’. Lava flows to the East at similar rates as yesterday. The lava is now flowing in the river bed of Jökulsá á Fjöllum. No explosive activity due to the lava and river water interaction has been observed, but steam rises from the lava. Concentrations of SO2, comparable to those measured yesterday in Reyðarfjörður, may affect people with underlying respiratory problems although others should not experience any significant discomfort. Efforts to increase the gas monitoring in inhabited areas are on-going. Data from newly installed SO2 monitoring stations will be accessible later today. Yesterday 8th September no chemical pollution, related to the eruption, was detected and none is expected today. Instructions from the office of the Chief Epidemiologist and The Environmental Agency can be found on their web-sites. Scientists on the site, have had to leave the area repeatedly as concentrations of gas reached dangerous levels, due to sudden changes in wind conditions. At the eruption site local wind anomalies can occur due to thermal convection from the hot lava. This makes the conditions on site extremely dangerous as winds can change suddenly and unpredictably. Around 150 earthquakes have been recorded since midnight. The largest two earthquakes, 3.8 and 5.2 in magnitude occurred on the northern rim of Bárðabunga Caldera. Small but continuous low frequency tremor has been observed for the last few days. The migration of magma could stop, resulting in a gradual reduction in seismic activity and no further eruptions. The dyke could reach the Earth’s surface at different locations outside the glacier. Lava flow and/or explosive activity cannot be excluded. The intrusion again reaches the surface under the glacier leading to a significant subglacial eruption. This would most likely produce a flood in Jökulsá á Fjöllum and perhaps explosive, ash-producing activity. An eruption in Bárðarbunga. The eruption could cause an outburst flood and possibly an explosive, ash-producing activity. In the event of a subglacial eruption. Flooding would most likely affect Jökulsá á Fjöllum, but it is not possible to exclude flood paths to Skjálfandafljót, Kaldakvísl, Skaftá and Grímsvötn. Inspection of rock samples from Holuhraun lava indicates that the erupted magma contains minor amount of plagioclase phenocrysts (<1%) and even scarcer olivine phenocrysts. Chemical analyses show that the magma is slightly olivine-normative tholeiite (0-5 wt% ol). A few samples have been cut and polished for inspection, photography and chemical analyses with a scanning electron microscope equipped with a backscatter-electron detector and an energy-dispersive spectrometer (SEM-EDS). 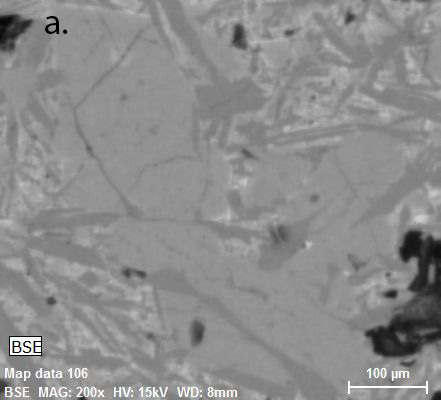 It is seen that the samples have crystallized to a variable degree, but in general the groundmass mostly comprises subophitic intergrowth of plagioclase and augite (Figure 1), along with smaller amounts of olivine. All samples also contain variable amounts of interstitial glass, whereas Fe-Ti oxides are absent or in very small amounts only. 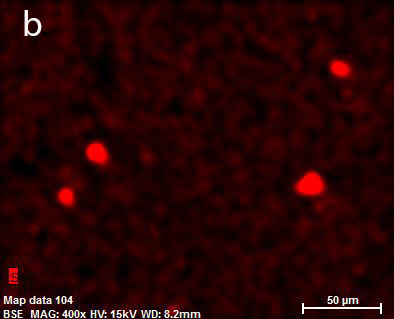 This suggests that the samples had quenched before Fe-Ti oxides could form. 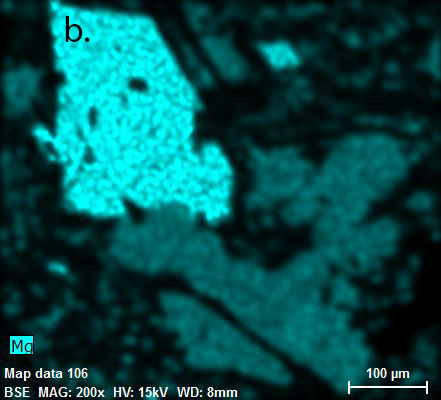 Chemical analyses with the SEM-EDS instrument indicate that the groundmass plagioclase has the composition An75-80, while olivine and augite have Mg number 75-80. The institial glass has become quartz normative. The composition of two plagioclase phenocrysts that were measured was about An84 and An90. 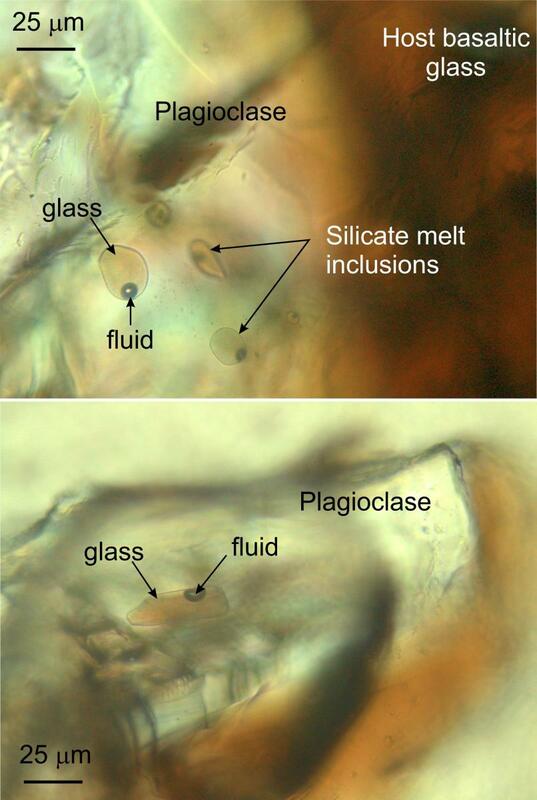 Immiscible sulfides globules, noted in highly glassy samples of the first eruption, persist in later, more crystallized samples of the newer Holuhraun lava (Figure 2). The composition of the globules seems to vary to some degree, but Fe is always the most abundant cation, followed by Cu and Ni and minor amounts of Co. The relative abundance of Cu and Ni is varies significantly, even in a single globule. Figure 1. 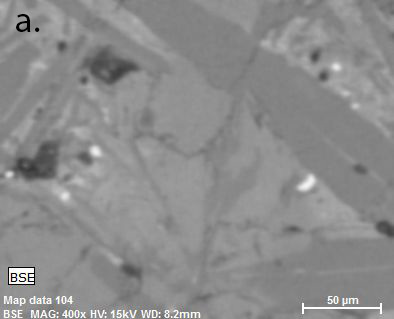 SEM-EDS images of sample WM1491-4 from Holuhraun lava showing intergrowth of plagioclase, augite and olivine along with some interstitial glass; a) backscatter-electron image; b) X-ray map for Mg with olivine as the brightest mineral, then augite and plagioclase darkest . Figure 2. SEM-EDS images of sample KPRW-5 from Holuhraun lava showing intergrowth of plagioclase and augite, and some interstitial glass and a few sulfide globules; a) backscatter-electron image; b) X-ray map for S revealing the presence of sulfide globules as bright spots. 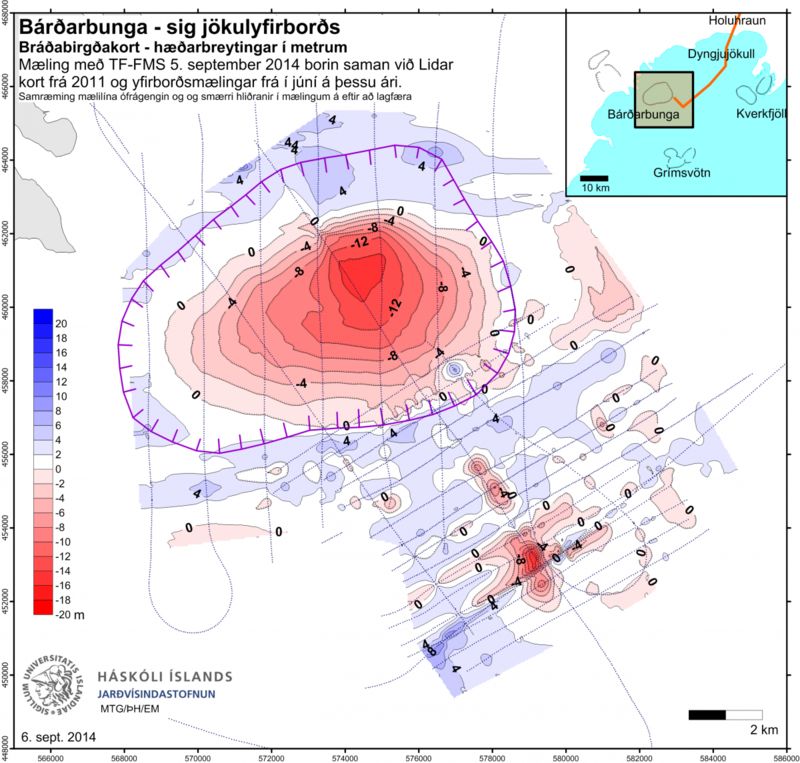 Bárðarbunga subsidence – new data Surveying of the subsidence of the Bárðarbunga caldera was done this morning from the civil avaiation aircraft TF-FMS using radar profiling. The results show that the subsidence, first detected on Friday 5 September, has reached 18,5 m, of which 2,5-3 m occurred over the last three days. The events in Bárðarbunga can be called a slow caldera collapse. At this moment the total subsidence is small compared to known caldera collapses elsewhere but it is also impossible to say how long this event will last. Scientists from the Icelandic Met Office and the Institute of Earth Sciences and representatives of the Civil Protection in Iceland attend the meetings of the Scientific Advisory Board of the Icelandic Civil Protection. Also, representatives from The Environment Agency of Iceland and the Chief Epidemiologist from the Directorate of Health, were present. • The eruptive activity at Holuhraun continues at similar intensity. o The eruption sites are the same as before. Lava flows to the East at similar rates as yesterday. Although the lava is now in contact with the river Jökulsá á Fjöllum, it does not reduce the lava flow rates significantly. No explosive activity due to the lava and river water interaction has been observed, but steam rises from the lava. o The extent of the lava is now approximately 19 square km. o No activity is now detected on the southernmost fissure although small amounts of gas and steam are rising from it. o Measured concentrations of SO2 in Reyðarfjörður, suggest that people with underling respiratory problems might be affected although others should not experience any significant discomfort. o Efforts to increase the gas monitoring in inhabited areas are on-going, by The Environment Agency of Iceland. o If eruptive activity continues at similar rates, the air quality in Eastern part of Iceland, will remain similar. 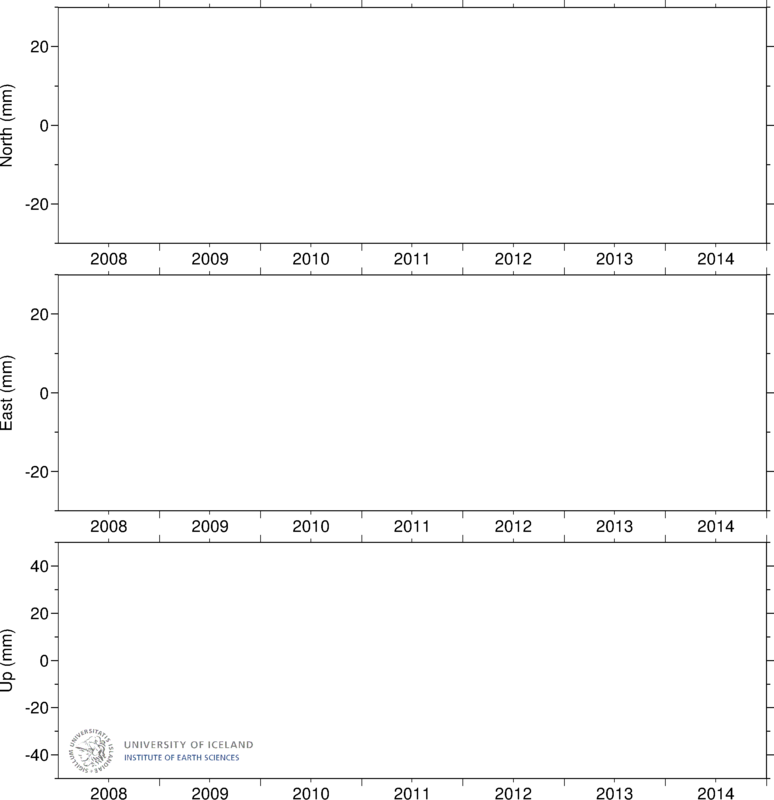 o Gas emissions at the eruption site remain high. As local gas concentrations at the site can be life threatening, people at the eruption site should wear gas masks and gas meters. o Scientist on site, have had to leave the area as concentrations of gas reached dangerous levels, due to sudden changes in wind conditions. o At the eruption site local wind anomalies can occur due to thermal convection from the hot lava. This makes the conditions on site extremely dangerous as winds can change suddenly and unpredictably. • The seismicity has reduced since yesterday. Around 80 earthquakes have been recorded since midnight. Around 07:20 UTC, a magnitude 4.7 earthquake occurred on the rim of Bárðabunga Caldera. Small but continuous low frequency tremor has been observed for the last few days. • GPS observations show insignificant crustal movements supporting the assumption that the amount of magma flowing into the dyke continues to be similar to the magma erupted to the surface. o The dyke could reach the Earth’s surface at different locations outside the glacier. Lava flow and/or explosive activity cannot be excluded. o The intrusion again reaches the surface under the glacier and possibly leads to a significant eruption. This would most likely produce a flood in Jökulsá á Fjöllum and perhaps explosive, ash-producing activity. • Other scenarios cannot be excluded. An overview of the lava this morning 8.9.2014 (yellow line) compared to the extent in the early evening 7.9.2014 (orange polygon). Today most of the earthquakes have been located in Bárðarbunga caldera, at the eruption site, in Dyngjujökull and at Herðubreiðatögl. The two largest events occurred this morning (M4.6 and M5.4) at 3:27 and 7:07 UTC in Bárðarbunga caldera. We have recorded about 155 earthquakes since this morning and the seismic tremor has been lower than yesterday . Earth scientists in the field report that the eruptive activity in the northernmost part of the north-fissure has no more lava fountaining, whereas the central craters are the most active like previous days. The new fissure in the south shows no visible activity since this afternoon. 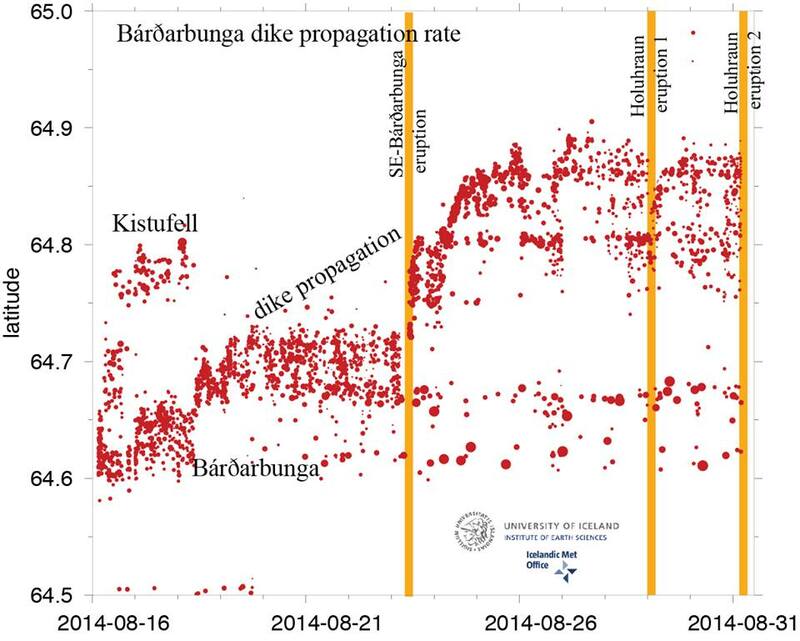 An overview of Bárðarbunga seismicity and dike propagation, August 16th-September 7th. – Bryndís Brandsdóttir Revised earthquake locations from IMO, circle size represents earthquake magnitude. Larger events are confined to the northern and southern caldera rim of Bárðarbunga, the caldera itself is mostly devoid of earthquakes. Seismicity in northern Dyngjujökull and Holuhraun has decreased markedly following the initiation of the second Holuhraun eruption (shaded area). The eruptive activity at Holuhraun has not decreased. Magma flow is between 100 and 200 m3/s. 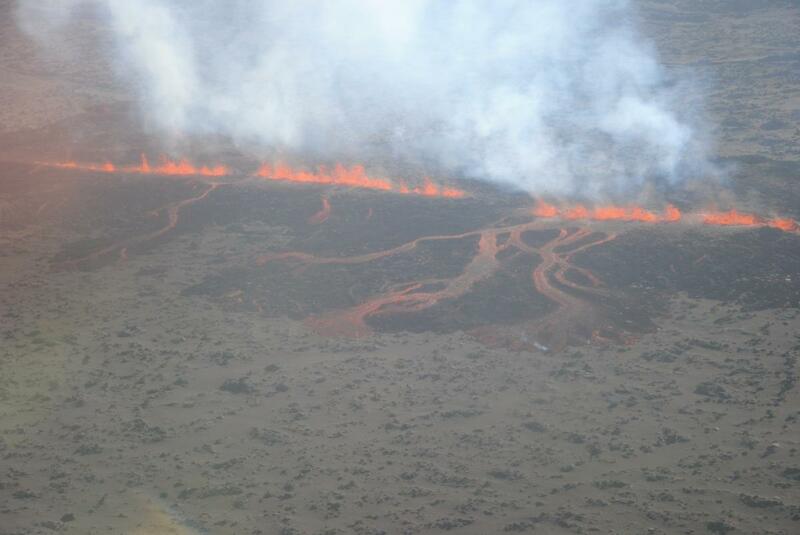 The lava advances by about 1 km/day and its area yesterday afternoon was around 16 km2. o The eruption sites are the same as before. The eruptive intensity on the southern fissure that opened on Friday is much less than on the northern fissure that has been active since the beginning of the eruption. 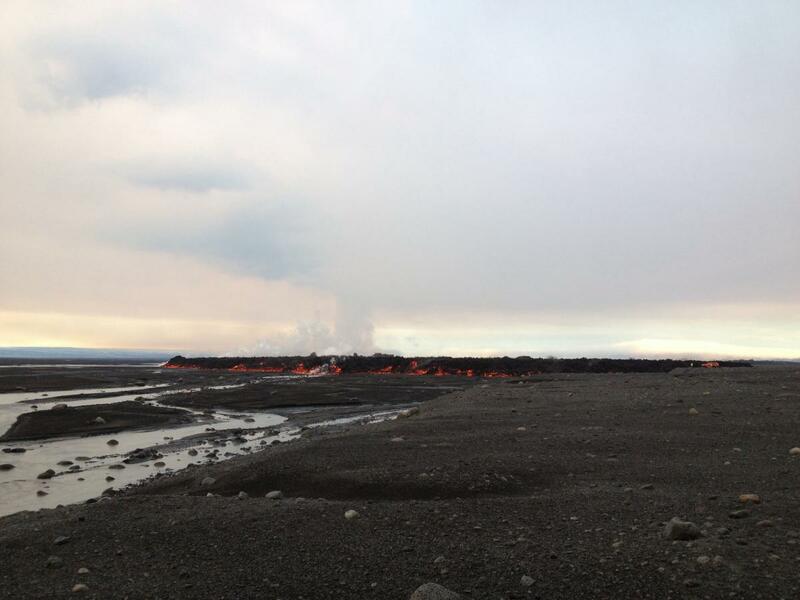 o The lava tongue now extends 11 km to the north and has reached the western main branch of Jökulsá á Fjöllum river. However, no explosive activity due to the lava and river water interaction has been observed, but steam rises from the lava. o A white eruption cloud rises 3 – 4 km and is directed to the north and northeast. Seismicity in the area is similar to yesterday. Around 140 earthquakes have been recorded since midnight. At 03:30 this morning, a magnitude 4.6 earthquake occurred at the rim of the Bárðarbunga caldera. Shortly after 07:00, a magnitude 5.4 earthquake occurred on the rim, one of the largest recorded since the start of the present activity. The amount of magma flow into the dyke seems to be similar to the magma erupting from the fissures. GPS stations outside the glacier record insignificant crustal movements. o The migration of magma could stop, resulting in a gradual reduction in seismic activity and no further eruptions. o The dyke could reach the Earth’s surface at different locations outside the glacier. Lava flow and/or explosive activity cannot be excluded. o The intrusion again reaches the surface under the glacier and possibly leads to a significant eruption. This would most likely produce a flood in Jökulsá á Fjöllum and perhaps explosive, ash-producing activity. o An eruption in Bárðarbunga. The eruption could cause an outburst flood and possibly an explosive, ash-producing activity. In the event of a subglacial eruption, it is most likely that flooding would affect Jökulsá á Fjöllum. However it is not possible to exclude the following flood paths: Skjálfandafljót, Kaldakvísl, Skaftá and Grímsvötn. 7th September 2014 – 07:00. From Thor Thordarson. The lava has now reached to the main channel of the glacial river Jökulsá á Fjöllum. Steaming occurs there. Earthquake activity today has been in similar places as recent days, in Bárðarbunga caldera, at the eruption site, Dyngjujökull and at Herðubreiðatögl. Two earthquakes 4,4 and 4,3 were recorded in Bárðarbunga caldera in the afternnon, at 14:32 and 18:43 respectively, but this morning at 05:40 a magnitude 5 was measured in a similar location. The total number of recorded earthquakes since midnight is around 170. Earth scientists at the eruption site think that the eruptive activity is similar as yesterday. Seismic tremor has low amplitudes today . In the surveillance flight yesterday the ice-surface at Bárðarbunga was measured with the radar system of Isavia’s aircraft. The measurements show large changes on the ice-surface. Up to 15 m subsidence has occurred in the centre of the caldera, which corresponds to a volume change of 0.25 km3. The shape of the subsidence area is in accordance with the elevation of the caldera floor having lowered by that amount. o Subsidence of this order has not been observed in Iceland since measurements of crustal movements started around the middle of last century. 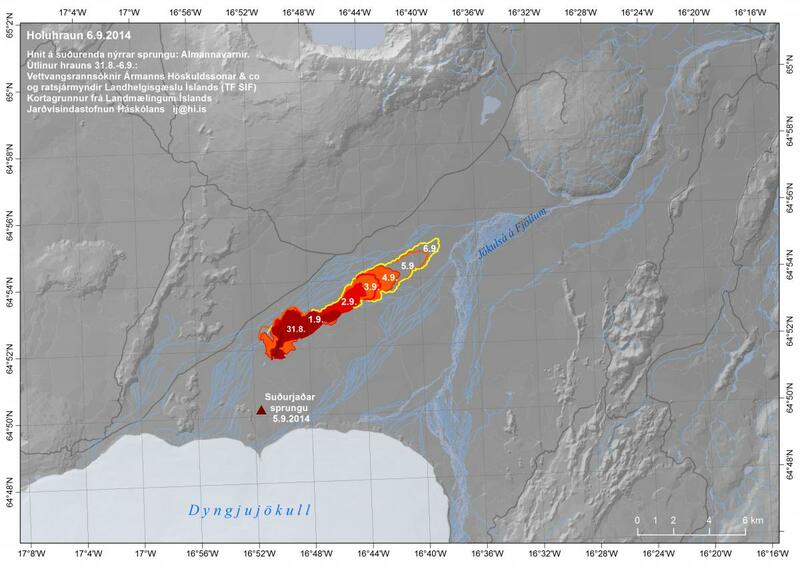 o No signs of eruption or increased geothermal activity in the Bárðarbunga caldera are observed. o The volume of the subsidence in Bárðarbunga is considerable portion of the total volume of the magma dyke. o The most probable explanation is that this subsidence is related to the recent high seismic activity and subsurface magma flow to the northeast. In the surveillance flight yesterday a shallow, wide depression was observed on the surface of Dyngujökull, 10 km from the glacier edge. Another depression 6 km from the Dyngjujökull ice edge, which has been monitored over the last few days has deepened and is now 35 m deep. o It is likely that these depressions are sings of small and short sub glacial eruptions. The eruptive activity at Holuhraun is the same as yesterday. o Two eruptive fissures are active. The main activity is on the same fissure that has been active since the eruption began. In addition the fissure that opened yesterday morning is still active. o The lava now extends 10 km ENE and has just under one km to reach Jökulsá á Fjöllum river. Seismic activity has decreased since yesterday. Approximately 90 earthquakes have been detected since midnight. 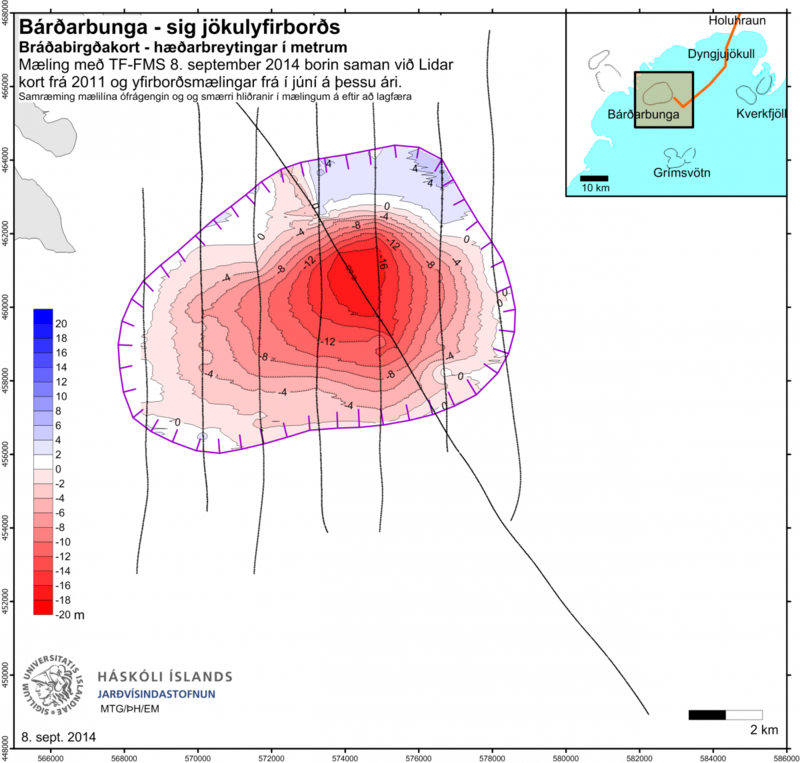 One earthquake, of magnitude 5 was located in the Bárðarbunga caldera at 05:40 UTC. 14 earthquakes of magnitudes greater than 5 have been located since 16 of August. Deformation changes since yesterday, measured with GPS north of Vatnajökull are small. 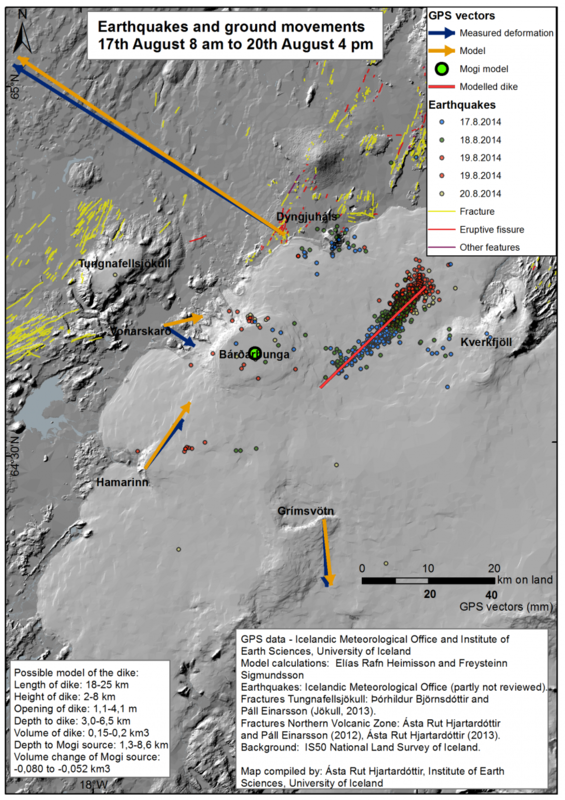 New mapping of the surface of Bárðarbunga caldera indicates up to 14 m of subsidence inside the caldera. This map is obtained by differencing radar images (Lidar) taken in 2011, surface observation in June 2014 and new airborne radar altimeter observations from Sept. 5. A new map of the extent of the lava updated this morning. The map was compiled by Ingibjörg Jónsdóttir (IES) using information from our scientists in the field. The following is a summary of a report from Thor Thordarson, our volcanologist who is now in the field. The main lava flow continues to lengthen toward NE, and a smaller tounge toward west, that now covers an intended parking lot. The main eruptive activity is stil on the fissure that opened on Aug. 31. A new fissure became active early Sept. 5 (seen by a reporter at 7am). Initially, there were two fissures active, but now only the northern one is erupting. Yesterday afternoon the activity on the new fissure was concentrated along ~400 m segment. There are several faults on the eastern and western margin of the graben that has been forming between the eruptive fissures and the edge of Dyngjujökull glacier. Thor estimates a throw of ~8 m on one of these faults on the western side (photo from Sept. 3). Major element composition of lava erupted in the second Holuraun phase (ICP). Preliminary results. At about 7:00 UTC this morning RÚV reported that new eruptive fissures had opened to the south of the on-going eruption. Two new eruptive fissures formed south of the previous eruption site in Holuhraun, in a graben, that had formed above the intrusion, about 2km away from Dyngjujökull. The eruptive fire fountains from the new fissures are substantially smaller than in the older fissure. Steam and gas rises in a south eastern direction from the fissure. The cauldron in Dyngjujökull seems to have grown deeper since the last observation. No changes are visible in Bárðarbunga. Substantial amounts of SO2 are still being released to the atmosphere in association with the eruption. 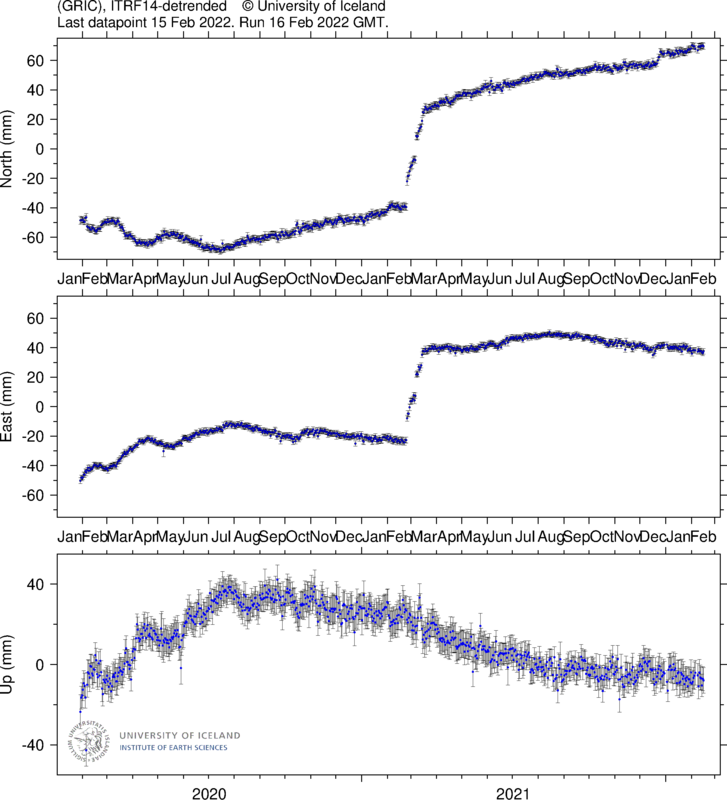 Conductivity measurements show a slight increase in conductivity in Jökulsá á Fjöllum. Some tremor was detected on seismometers shortly after 3:00 UTC last night. It decreased at about 6:00 UTC this morning. Considerable activity is in the northern fissure (fissure 1) and the height of the steam cloud is about 15,000 feet. There are no indications of the eruption in Holuhraun being in decline. The lava from fissure 1 continues to flow to the east north east and has grown in area since yesterday. Seismicity in the area is similar to yesterday’s activity. About 170 earthquakes were detected since midnight. Two earthquakes of magnitudes 4,4 and 5,3 were detected in the Bárðarbunga caldera region at around midnight UTC. GPS displacements have continues to decrease and are now within uncertainty limits. The dike could reach the Earth’s surface at different locations outside the glacier. Lava flow and/or explosive activity cannot be excluded. The intrusion reaches the surface and another eruption occurs where either the fissure is partly or entirely beneath Dyngjujökull. This would most likely produce a flood in Jökulsá á Fjöllum and perhaps explosive, ash-producing activity. An eruption in Bárðarbunga. The eruption could cause an outburst flood and possibly an explosive, ash-producing activity. In the event of a subglacial eruption, it is most likely that flooding would affect Jökulsá á Fjöllum. However it is not possible to exclude the following flood paths: Skjálfandafljót, Kaldakvísl, Skaftá and Grímsvötn. New eruption fissure has opened in Holuhraun! – At about 7:00 UTC this morning RÚV reported that new eruptive fissures had opened to the south of the on-going eruption. 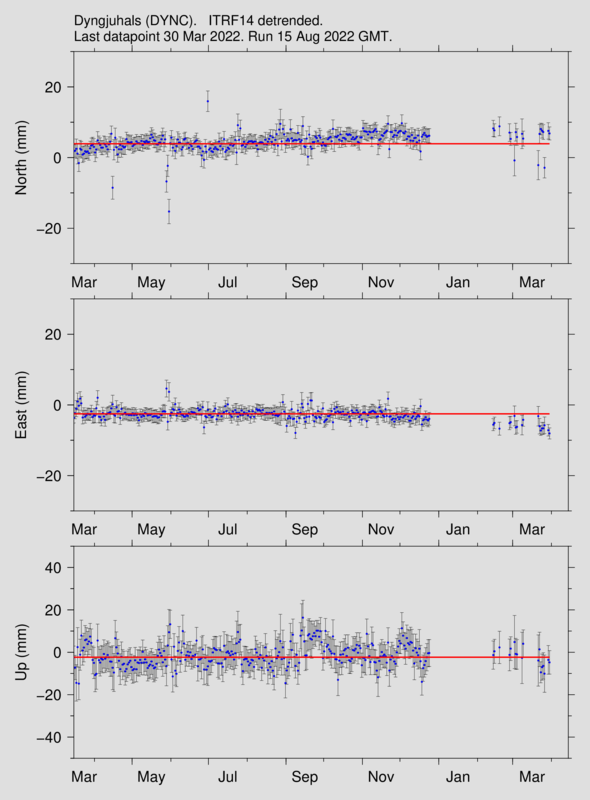 The intensity of the ongoing eruption in Holuhraun is not declining. 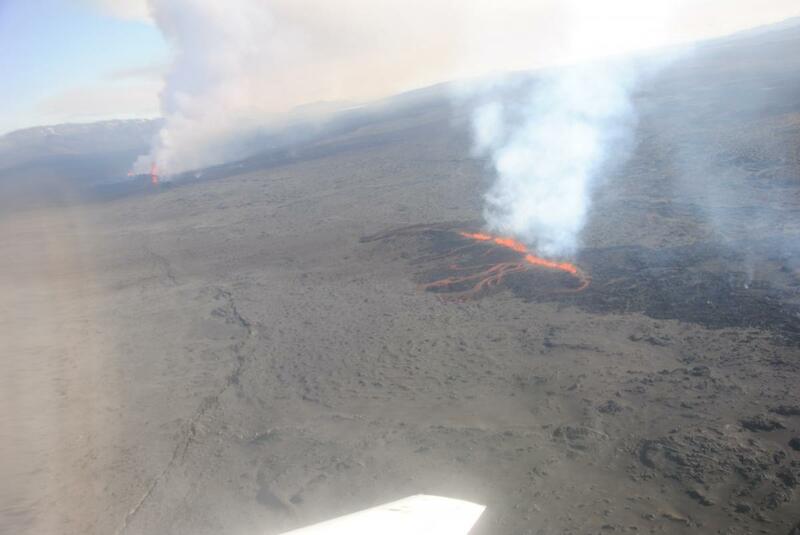 Lava is flowing toward ENE and it has been elongated considerably since yesterday. Since this morning, a preliminary estimate of lava field extension is about 10.8 km2. Seismic activity is still detected in the northern part of the dyke intrusion, along the eruption site and extending south below Dyngjujökull. Event rates are lower than in recent days, 180 earthquakes have been detected since midnight until noon. 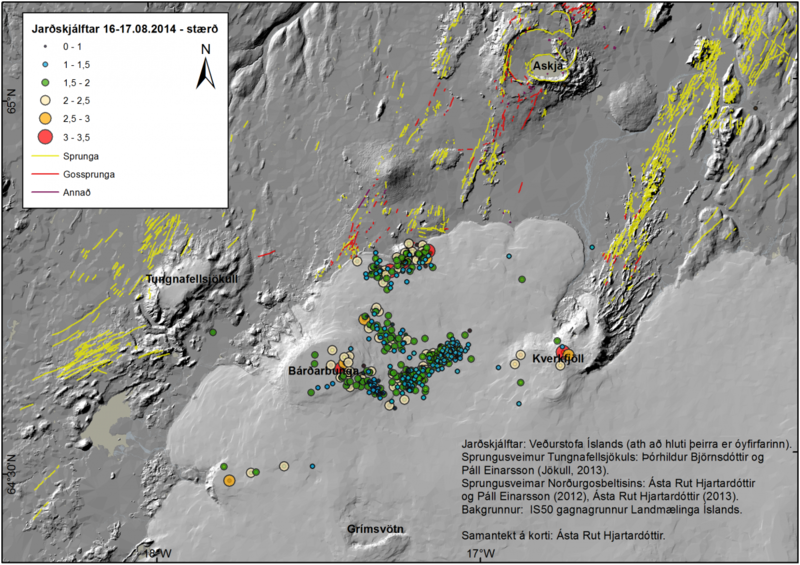 Four events larger than M4 have been detected in Bárðarbunga caldera. The largest one (M4.8) occurred last night at 03:09. The low frequency tremor seen yesterday disappeared last night but started again this morning, however minor compared to yesterday. The source of the tremor is not certain however possible explanation could be magma-water interaction although this interpretation has currently not been confirmed by other observations. There are no signs of a subglacial eruption under Dyngjujökull. No obvious changes such as increased water flow or cauldrons on the glacier surface were observed from scientists on board TF-SIF yesterday. Water meters in Jökulsá á Fjöllum do not show any unusual changes in discharge and electric conductivity. The GPS time series indicate slower rate of deformation in the last 24 hours. The current deformation pattern north of Vatnajökull still suggests volume increase in the dyke. No significant signs of deformation are observed around Bárðarbunga. There have been no observations of ash-fall away from the eruption site. Ash production is negligible. Sulphur dioxide emission continues. Low-wind speed condition is present in the area at the moment. Based on radar images the eruption cloud from today (composed of steam and volcanic gases) has not drifted far away and is mostly concentrated around the eruption site. Stations measuring SO2 further away from the eruption site are showing concentration below health and safety thresholds. Since this morning, the cloud reaches 6 km of altitude. The volcanic cloud will drift towards south in the coming hours due to wind rotation. The dike could reach the Earth’s surface causing another eruption, possibly on a new fissure. Lava flow and (or) explosive activity cannot be excluded. 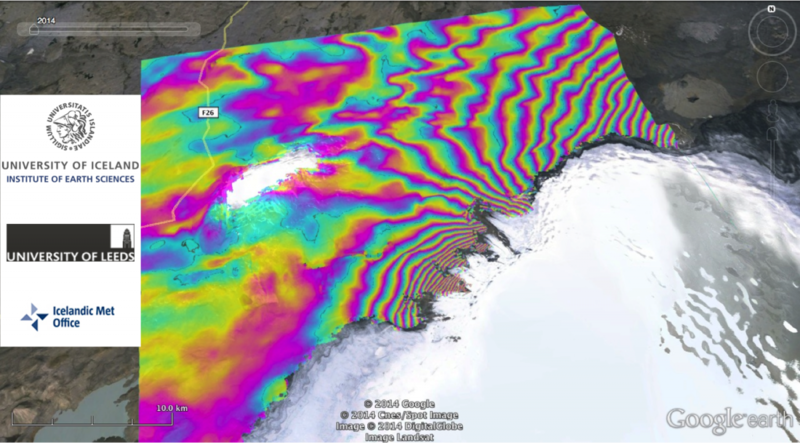 Modelling of continuous GPS measurements north of Vatnajökull show significant horizontal deformation during Aug. 31 to end of day Sept. 2, indicating a volume increase in the dike intrusion. 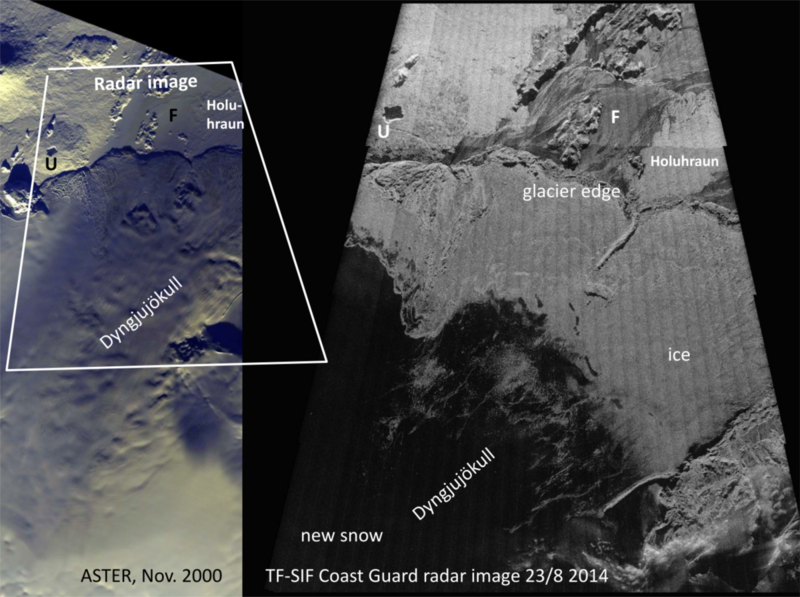 Radar images show a graben formed south of the eruption and cracks extend onto the edge of Dyngjujökull (see images below). This demonstrates large horizontal and vertical displacements over the dike. As long as there is a net influx of magma to the dike, the eruptive fissure could extend further south, causing increased hazard in the area. Blue arrows (with 95% confidence ellipses) are measured displacements, red arrows show the model prediction. Green line is the surface projection of the dike model. Earthquakes recorded by the IMO during this time are shown with red dots, green stars indicate M>4 events. Magma contains dissolved gases that are released into the atmosphere during eruptions. Gases are also released from magma that either remains below ground (for example, as an intrusion) or is rising towards the surface. In such cases, gases may escape continuously into the atmosphere from the soil, volcanic vents, fumaroles, and hydrothermal systems. The major volcanic gases emitted from basaltic magma are H2O, CO2, SO2, H2, CO, H2S, HCl and HF. The most abundant gas is water vapor (H2O), followed by carbon dioxide (CO2) and sulfur dioxide (SO2). • Earthquake activity continues – around 160 earthquakes have been recorded since midnight today. Seismicity is occurring mostly beneath the northern edge of Dyngjujökull. A magnitude 5.5 earthquake occurred at 03:08 UTC today on the northern side of the Bárðarbunga caldera. • GPS measurements show that the volume of the dyke intrusion has increased since the beginning of the eruption; this signifies that more magma is entering the dyke than is being erupted. • Despite no sign of a volume decrease in the dyke, GPS measurements show that the rate of ground deformation has slowed. • Recent radar images show a 0.5 – 1 km wide depression that has formed both in front of and beneath Dyngjujökull. Signs of the depression extend about 2 km into the ice margin. The increasing thickness of the glacier decreases the visual extent of fracturing associated with the depression, so it is likely that the area extends further beneath Dyngjujökull. • In light of GPS, radar and seismic results, it is possible that the ongoing eruption could progress southward under Dyngjujökull. This would lead to immediate flooding hazards on the floodplain in front of Dyngjujökull. Consequently, risk assessments for scientists working in the area will be reviewed. • The volcanic eruption continues on Holuhraun; the main path for lava is to the east-north-east. • At 08:00 UTC today the total area of the lava flow was estimated at 7.2 km2. • There have been no observations of ash-fall. Ash production is almost negligible. • Sulphur dioxide continues to be detected near to the eruption site. The eruption cloud is drifting to the north-east from the eruption site. The field group of the IES measured the northern and eastern edge of the lava flow at 14:00 yesterday. The lava was then about 6 km long and had advanced about 2 km in 24 hours. The discharge of magma from the fisssure is estimated to have been 100-150 m3/s in the 24 hours before 14:00, about one third of the rate on the first day. Photomicrograph of silicate melt inclusions in plagioclase crystals picked from sample 11 erupted on 31st of August. A noticeable decrease in seismicity has occurred during the last 24 hours. The level of activity is approximately half of that during recent days. Since midnight today, around 300 earthquakes have occurred. At the same time yesterday, 01 September, around 500 earthquakes had been detected. The rate of deformation at GPS sites closest to the dyke intrusion has decreased. Together with an overnight decrease in seismicity, this implies that magma inflow appears to match magma outflow at the eruption site. The eruption has not created any ash-fall. A white plume of steam and gas rises from the eruption on Holuhraun, reaching an elevation of about 4.5 km above sea level. Downwind, a volcanic cloud extends from the eruption site. Yesterday afternoon, a white cloud from the eruption extended 60 km to the north-north-east. In comparison to yesterday, more sulphur dioxide has been measured in the eruption cloud. Sandstorms on the floodplain around the eruption site have contributed fine-grained particles to the eruption cloud. This was seen as a light-brown haze earlier today near to Egilsstaðir. Two very small tephra fall sectors are present on the west side of the fissure. The first sector is comprised of fine-grained grey ash with origin at the southern part of the active fissure. This tephra fall rests on the surface of two fresh and westward trending lava flows surrounding the venting area on the southern end of the fissure. The deposit was distributed from about 150 m along the fissure and thickness of the fall deposit at the vents is 2 cm. 10 m to the west of the vents the thickness drops to 0.5 cm. Further away from the vents the deposit was eroded and remobilized. Thickness estimated to be less than mm in the area >20 m away from craters. Beneath the grey ash is a 0.3-0.4 cm thick lithic layer, comprised of angular and rounded lithics of approximate 0.1-0.2 cm in diameter, this lithic layer was only observed within 10m of the vent. The second tephra sector is a red-brown ash fall observed close to the largest vent on the new fissure. The deposit reached up to 10 m from its vents and consists of red-oxidized and black juvenile fragments along with grains of plagioclase. The mean grain size of this deposit ranges from 0.2 cm at vent to 0.1 cm 10 m from vent. Water-escape features and dampness of the deposit indicates moist emplacement. Thickness at vent is 0.4-0.6 cm and 10 m west of the vent it has dropped to 0.2 cm. Jónas Gudnason, Kate Gallegher, and Johanne Schmith. 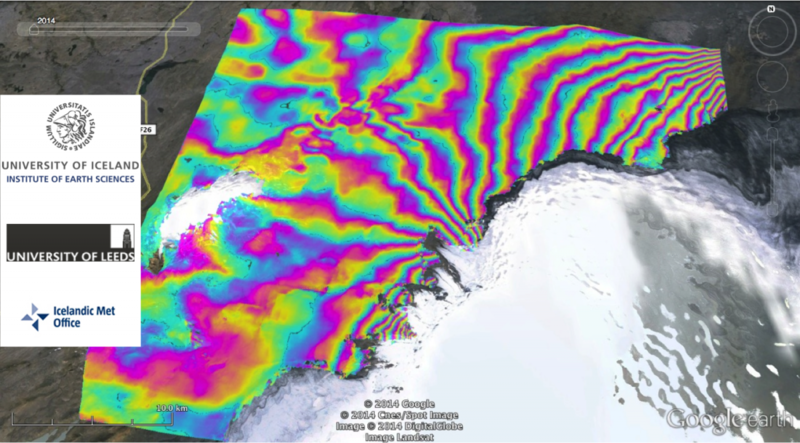 COSMO-SkyMED descending wrapped interferogram spanning the period 13 – 29 August 2014. Each interferometric fringe corresponds to 15 millimeters of relative change in range from ground to satellite. The highest fringe rate is observed closest to the subsurface dike causing the deformation. Decorrelation in the interferogram is caused by large amount of deformation at the surface, lava flows formed in an eruption between the acquisition of the images used, and surface change due to unstable sand. · A lava eruption started in Holuhraun shortly after 04 AM, on the same volcanic fissure, which erupted earlier this week. The fissure is estimated to be 1,5 km long. It was detected on Míla´s web-camera at 05:51 AM. Fewer earthquakes seem to follow the event than in the previous eruption, but more lava is being extruded. · At 07 AM the lava flow was around 1 km wide and 3 km long towards northeast. The thickness was estimated a few meters, the flow about 1000 m3 pr second. · Approximately 500 earthquakes were detected in the area and smaller than before. The strongest earthquake, M3.8 was in the Bárðarbunga caldera. Poor weather conditions prevail in the area, which makes detection of smaller earthquakes difficult. 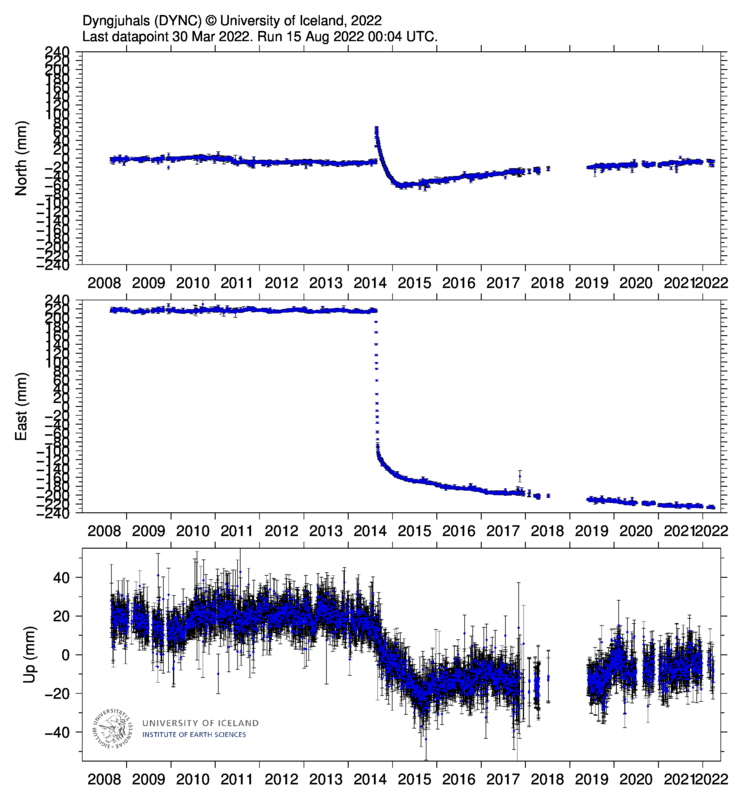 · GPS measurements show continued movements north of Dyngjujökull. · Gas emissions rise to a few hundred meters above the fissure. · Weather conditions make it difficult to follow the progression of the eruption, but scientists are in the area, using every opportunity to acquire information on gas and lava outflow. · Weather conditions do not allow overflight at this time. The opportunity to fly over the area will be assessed later today. The Aviation Colour Code for Bárðarbunga is at ‘red’ and the code for Askja at ‘yellow’. Observation from scientists in the field (05:15): It appears that the eruptive fissure is longer than in the last eruption. It is extending north and south on the same fissure. The eruption is a very calm lava eruption and can hardly be seen on seismometers (almost no gosórói). Visual observation confirm it is calm, but continuous. Observation from scientists in the field (07:15): It appears that the eruptive fissure is longer than in the last eruption. It is extending north and south on the same fissure. The eruption is a very calm lava eruption and can hardly be seen on seismometers (almost no gosórói). Visual observation confirm it is calm, but continuous. IMO has chnged the aviation colour code of Bárðarbunga to “red”. 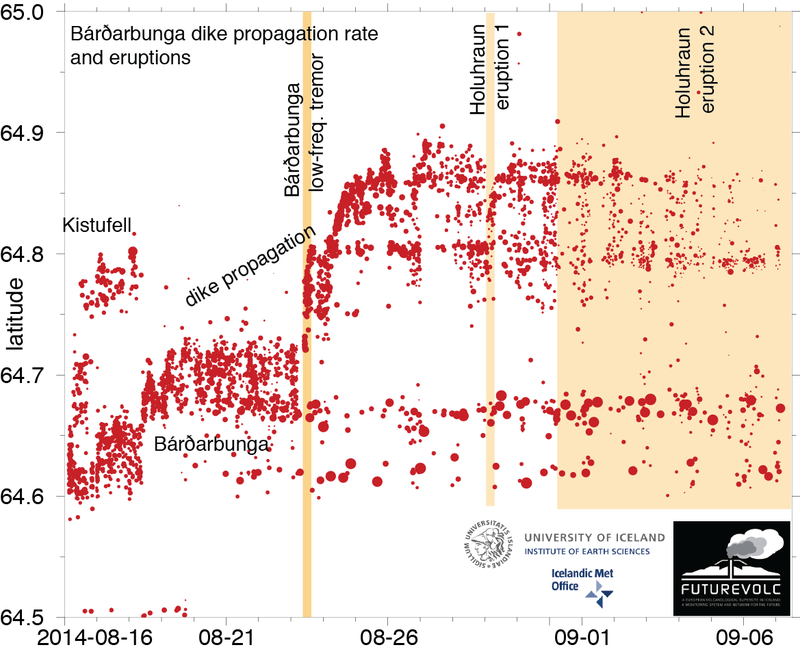 An upgraded plot of Bárðarbunga seismicity and dike propagation based on revised earthquake locations from IMO, circle size represents earthquake magnitude. The three eruptions are marked by orange colored bars. Note how rapid dike propagation northwards coincides with the SE Bárðarbunga flank eruption whereas a slight decrease in dike propagation is associated with the first Holuhraun eruption. · Earthquake activity continues on a 15-km-long region of the dyke intrusion, extending both into the Dyngjujökull glacier and the region north of the ice margin. Earthquakes have not migrated northwards during the last two days. Seismicity remains high and, since midnight, about 700 earthquakes have been detected in the region. · The largest earthquakes since midnight include: (i) a magnitude 4.5 event on the northern side of the Bárðarbunga caldera at 02:35 UTC; (ii) a magnitude 4.2 earthquake in the same region at 06:18 UTC; and (iii) a magnitude 5.4 earthquake on the south-eastern edge of the Bárðarbunga caldera at 07:03 UTC. During the last two weeks, several earthquakes of similar size have occurred on the edge of the Bárðarbunga caldera. These earthquakes are interpreted as signs of stress changes in the region of the caldera. · Over 20 micro-earthquakes have been detected in the Askja region. It is thought that these earthquakes have occurred due to stress changes north of the dyke intrusion. 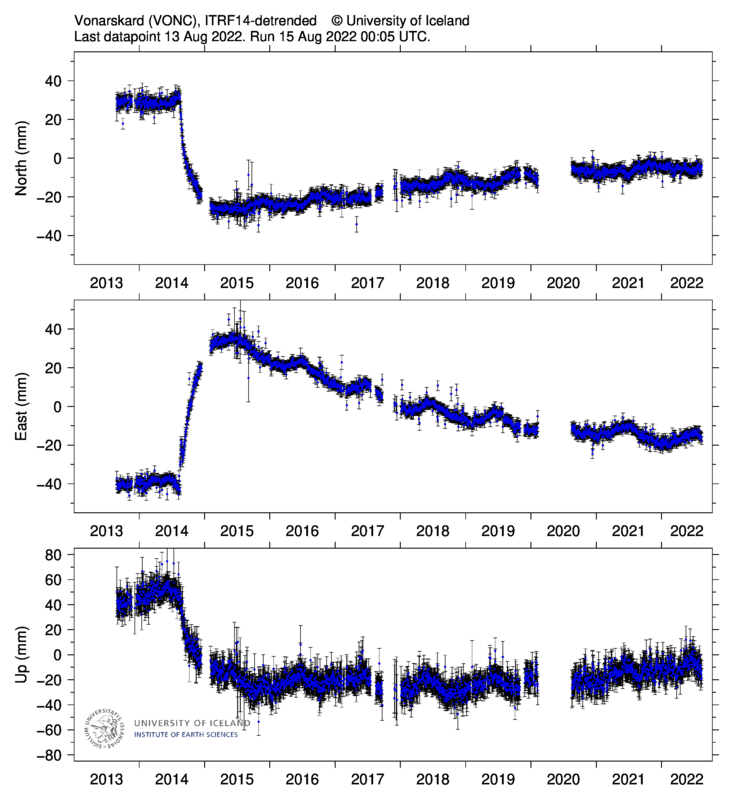 · GPS measurements show continued horizontal movements north of Vatnajökull due to formation of the dyke intrusion on the northern edge of the ice-cap. 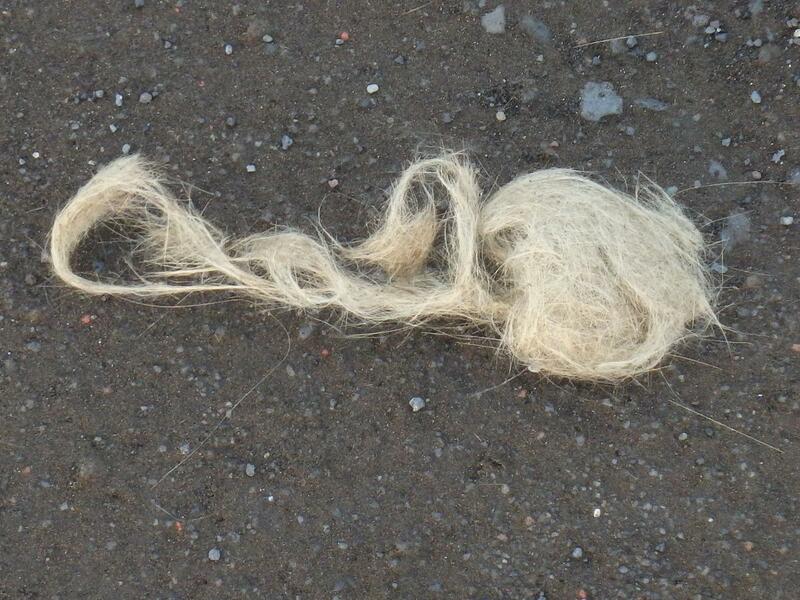 · No unusual changes in the discharge or electrical conductivity of Jökulsá á Fjöllum have been detected. The same applies to other rivers draining from north-western Vatnajökull. 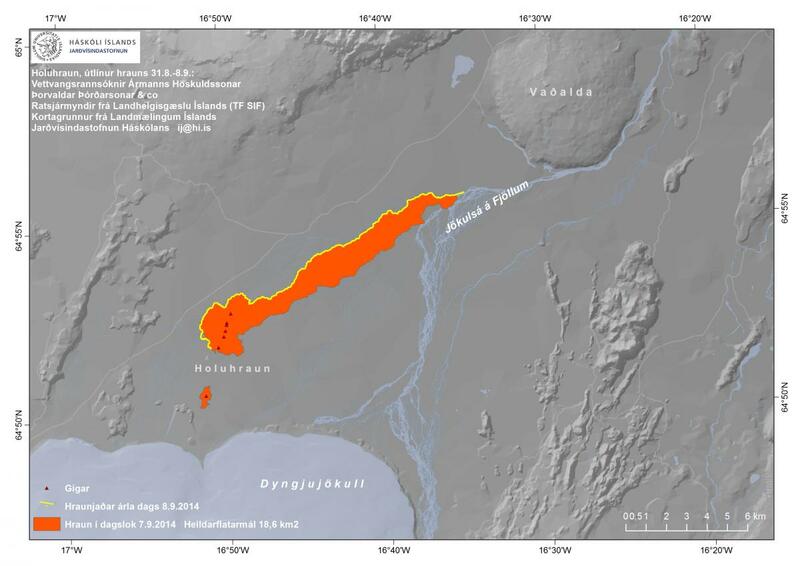 · A sample of newly erupted lava was taken from Holuhraun yesterday; analysis is ongoing. · There are no indications that the intensity of the activity declining. o The dike could reach the Earth’s surface north of Dyngjujökull causing another eruption, possibly on a new fissure. Such an eruption could include lava flow and (or) explosive activity. o The intrusion reaches the surface and an eruption occurs again where either the fissure is partly or entirely beneath Dyngjujökull. This would most likely produce a flood in Jökulsá á Fjöllum and perhaps explosive, ash-producing activity. 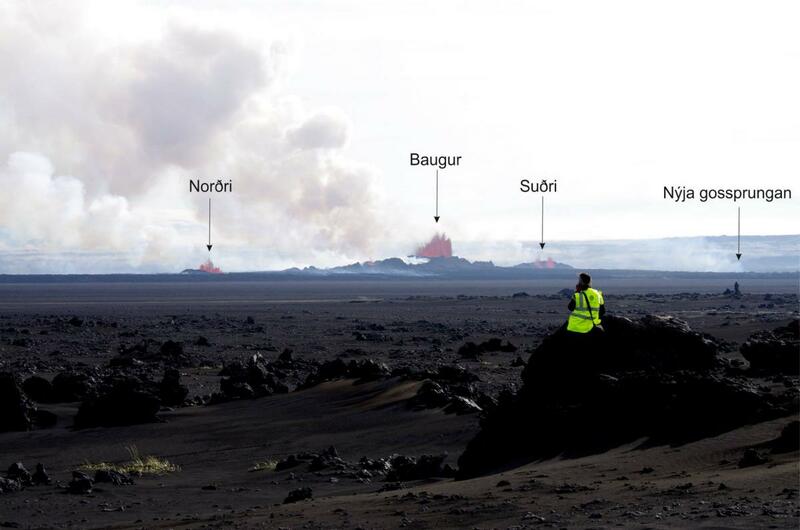 Bárðarbunga: 29.08.2014, 12:20 UTC – Scientists from the Icelandic Met Office and the Institute of Earth Sciences and representatives of the Civil Protection in Iceland attend the meetings of the Scientific Advisory Board of the Icelandic Civil Protection. • At 00:02 UTC signs of a lava eruption were detected on web camera images from Mila. The web-camera is located at Vaðalda, north-east of the eruption site. • Around midnight, weak signs of increased tremor were apparent on IMO’s seismic stations near to the eruption site. • At 00:20 UTC scientists in the field from the Icelandic Met Office, Institute of Earth Sciences and Cambridge University confirmed the location of the eruption. • The eruption occurred on an old volcanic fissure on the Holuhraun lava field, about 5 km north of the Dyngjujökull ice margin. The active fissure was about 600 m in length. • A small amount of lava drained from the fissure and by around 04:00 UTC, lava flow is thought to have stopped. • According to seismic data and web-camera imagery, the eruption peaked between 00:40 and 01:00 UTC. • At the beginning of the eruption, seismic activity decreased, although seismicity has since returned to levels observed in recent days. • Aerial observations by the Icelandic Coastguard show that only steam is rising from the site of the lava eruption. • There are no indications that the intensity of the activity declining. The dike could reach the Earth’s surface north of Dyngjujökull causing another eruption, possibly on a new fissure. Such an eruption could include lava flow and (or) explosive activity. The intrusion reaches the surface and an eruption occurs again where either the fissure is partly or entirely beneath Dyngjujökull. This would most likely produce a flood in Jökulsá á Fjöllum and perhaps explosive, ash-producing activity. • Other scenarios cannot be excluded. For example, an eruption inside the Bárdarbunga caldera. At 10:00 UTC, IMO changed the Aviation Colour Code for Bárðarbunga to ‘orange’, signifying that significant emission of ash into the atmosphere is unlikely. The aviation colour-code for the Askja volcano remains at ‘yellow’. Revised earthquake locations from IMO, circle size represents earthquake magnitude. Dike propagation commences following termination of Kistufell activity. 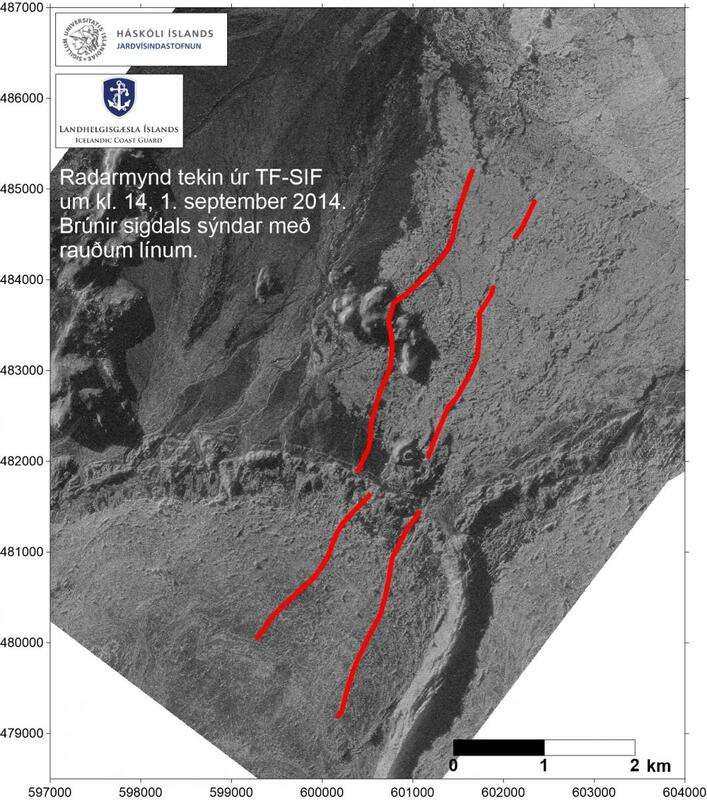 Advances in dike probation (marked by vertical lines) are related to large deflation events in Bárðarbunga. 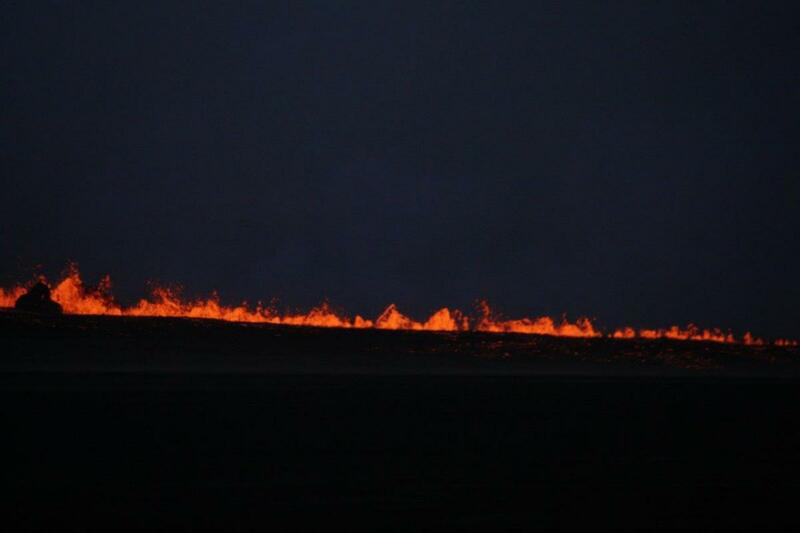 An eruption has started in Holuhraun north of Dyngjujökull at 00:02 this morning. An approximately 1 km long fissure (first estimate of scientists in the field) has opened, the eruption is purely effusive and no signs of explosive activity or ash emission has been detected so far. Based on volcanic tremor data, the eruption was strongest between 00:20 and around 02:00, peaking between 00:400 and 01:00. It has been decreasing until about 02:30 and is stabily active since. Seismic activity has decreased as a result of the pressure release, however a significant amount of earthquakes is still detected in the magma dike, between the eruption site and south to about 5 km into Dyngjujökull. 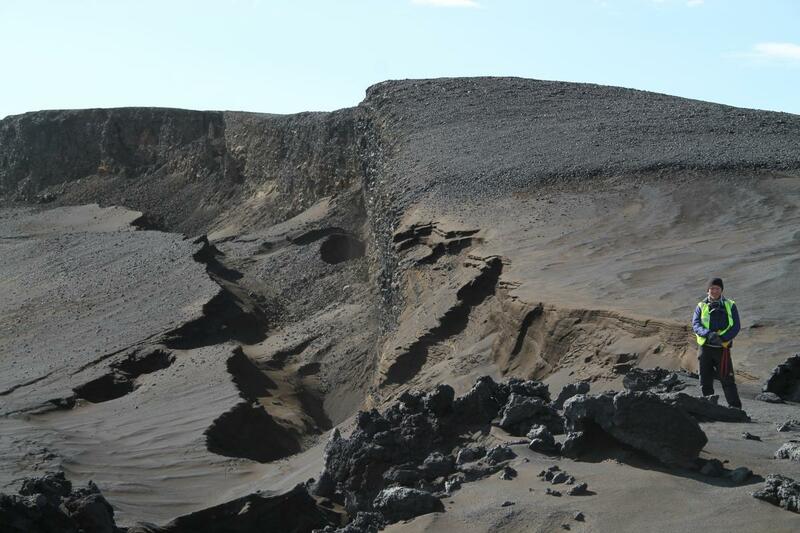 Strongest events last night were 3.8 in the caldera of Bárðarbunga at 04:37, as well as 2.9 at 05:39 and 3.5 at 06:38 in the dike. These earthquake are very closely monitored, but no significant change volcanic activity following these has been observed so far. 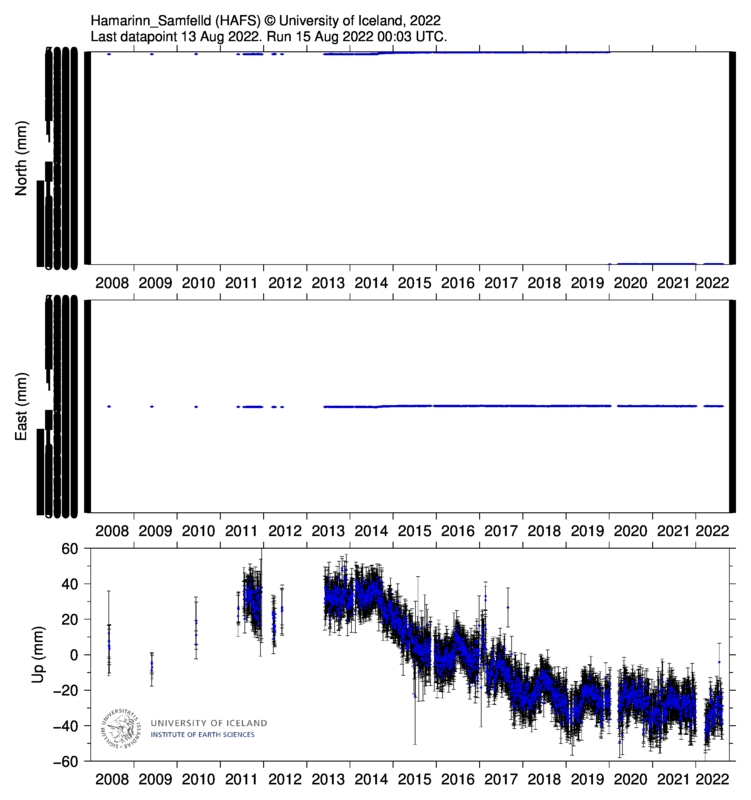 COSMO-SkyMED ascending interferogram spanning the period 11th August 2014 – 27th August 2014. Each fringe represents ~1.5 cm of displacement in the satellite’s line-of-sight. 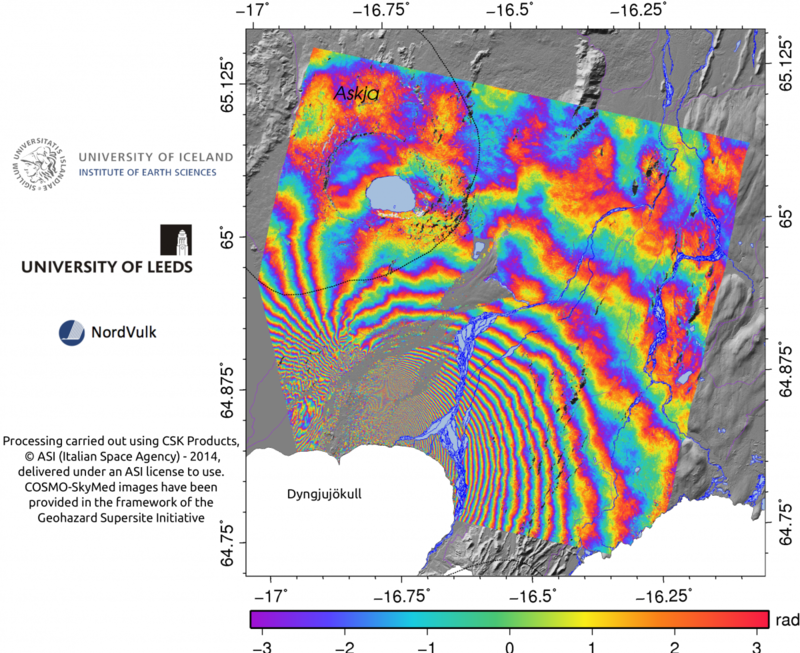 COSMO-SkyMED descending interferogram spanning the period 10th August 2014 – 26th August 2014. Each fringe represents ~1.5 cm of displacement in the satellite’s line-of-sight. Processing carried out using CSK Products, © ASI (Italian Space Agency) – 2014, delivered under an ASI license to use. COSMO-SkyMed images have been provided in the framework of the Geohazard Supersite Initiative. 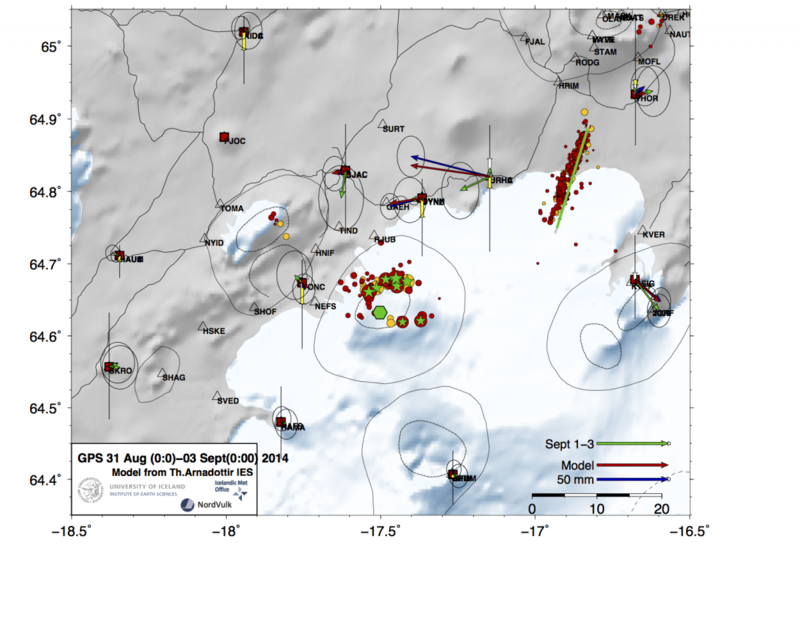 Model of surface deformation, incorporating both GPS and satellite data, spanning the period 10th August 2014 – 27th August 2014. The vertical plane represents the location of the dike at depth (red colours show maximum opening). The model indicates that the eruption (red star) is coming from the patch with maximum opening (5m), right at the surface (dark red patch). Black dots show earthquakes during the same time period (since the start of unrest on the 16th August 2014) located by the Icelandic Met Office. Model processed by A.J.H. Interferogram processing carried out using CSK Products, © ASI (Italian Space Agency) - 2014, delivered under an ASI license to use. COSMO-SkyMed images have been provided in the framework of the Geohazard Supersite Initiative. IMO has visual confirmation via scientists in the field and via webcam that a A fissure eruption (hraungos / sprungugos) has started north of Dyngjujökull (Holuhraun). Based on webcams and seismic data the eruption started at 00:02 (29/8/14). No volcanic ash has been detected with the radar system at the moment. The wind field condition in the area are wind blowing toward NW at 12 m/s at 5 km altitude. Seismic eruption tremor is low indicating effusive eruption without significant explosive activity. Satellite infrared images (Seviri 3,9 micron) confirm thermal anomaly at 00:38. The color code at Bárðarbunga has been changed to red. Scientists from the Icelandic Meteorological Office and the Institute of Earth Sciences, together with representatives of the Civil Protection in Iceland, met today to discuss the on-going unrest at the Bárðarbunga volcano. This morning, there was a flight over the Bárðarbunga area and the surface of the glacier was surveyed. No changes to the ice crevasses southeast of Bárðarbunga, that were seen yesterday evening, were observed. These crevasses were likely formed due to melting at the ice bottom. 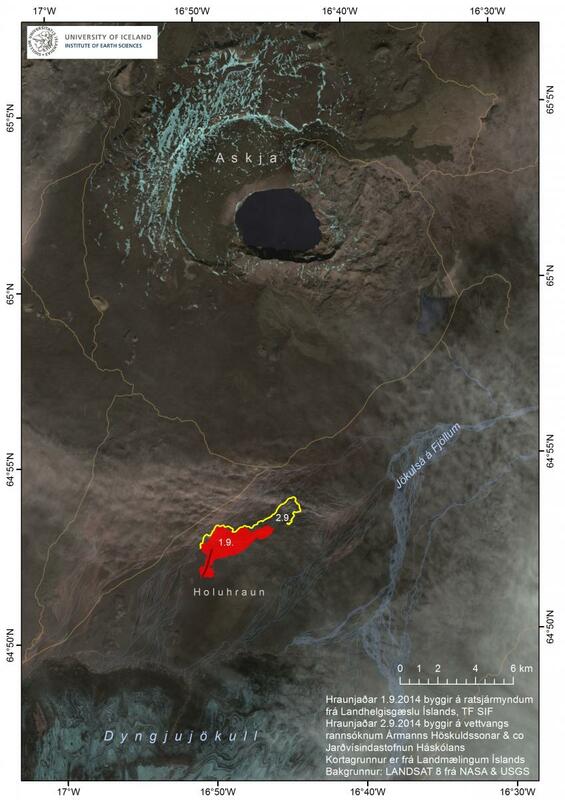 The depressions have been located southeast of the Bárðarbunga caldera, in all likelihood within the water divide of the river Jökulsá á Fjöllum. There are three circular crevasse formations, about 5 km in total length. The ice thickness in the area is 400-600 m.
Shortly before 08:00 this morning, there was a slight increase in seismic activity in Askja volcano. Changes in the stress field due to expansion caused by the dyke have an effect on the Askja area. Since yesterday, the length of the dyke under Dyngjujökull has increased by 1-1.5 km to the north, which is considerably less than in the last days. The dyke has now reached the fissure system of the Askja volcano and GPS measurements indicate that the area there is greatly affected. The conclusions from the meeting of the Scientific Advisory Board of the Icelandic Civil Protection will continue to be published at around noon, after the meeting, if necessary. From the Icelandic Met Office: The Aviation Colour Code remains at the ‘orange’ level for Bárðarbunga. The Aviation Colour code is raised to ‘yellow’ level for Askja. These are the conclusions of the meeting: • Intense seismi…city continues. Over 700 earthquakes have been recorded since midnight. Earthquakes are occurring mostly beyond the edge of the Dyngjujökull glacier and the intrusion itself has migrated about 1 km northwards since yesterday. • At 00:16 UTC today, a magnitude 5.3 earthquake occurred in the caldera of Bárðarbunga. At 02:50 UTC, another similar-sized earthquake (magnitude 5.2) took place in the same region. • At 01:52 UTC, a magnitude 4.5 earthquake was detected on the eastern side of the Askja volcano. This was followed by a few micro-earthquakes in the same area. • The dyke intrusion beneath Dyngjujökull is thought to be about 40 km in length. • Modelling of GPS data indicates that about 20 million cubic metres of magma have been added to the volume of the intrusion in the last 24 hours. • Modelling results suggest that the dyke intrusion is causing stress changes over a large area, including the region to the north of the dyke’s extent; this could account for the increased seismicity at Askja volcano. • There are no indications that the intensity of the activity declining. • From today, the afternoon status report will no longer be produced. However, if the situation escalates (i.e. imminent signs of an eruption), daily status reports will be reintroduced. The results of the scientific advisory board (this factsheet) will continue to be distributed daily at around midday. From the Icelandic Met Office: The Aviation Colour Code remains at the ‘orange’ level for Bárðarbunga. Intense seismicity continues. Over 500 events have been recorded since midnight. Seismicity continues to migrate northward. Seismicity is now concentrated on the 10 km long tip of the dike extending 5 km beyond the edge of the Dyngjujökull glacier. At 01:26 this morning an earthquake of magnitude 5,7 was observed beneath the Bárðarbunga caldera. The dyke beneath Dyngjujökull is now thought to be close to 40 km long. Modelling of GPS data indicates that about 50 million cubic meters of magma have added to the volume in the last 24 hours. The migration of magma could stop, accompanied by a gradual reduction in seismic activity. The dike could reach the surface of the crust, starting an eruption. In this scenario, it is most likely that the eruption would be near the northern tip of the dyke. This would most likely produce an effusive lava eruption with limited explosive, ash-producing activity. An alternate scenario would be the dyke reaching the surface where a significant part, or all, of the fissure is beneath the glacier. This would most likely produce a flood in Jökulsá á Fjöllum and perhaps explosive, ash-producing activity. Other scenarios cannot be excluded. For example, an eruption inside the Bárðarbunga caldera is possible but presently considered to be less likely. From the Icelandic Met Office: The Aviation Color Code remains at the ‘orange’ level. Intense seismicity continues. Over 700 events have been recorded since midnight. At 20:39 last night an earthquake of magnitude ~5 was observed beneath the Bárðarbunga caldera. Since then earthquakes in the caldera have been smaller. The dike beneath Dyngjujökull is now thought to be close to 35 km long. Modelling of GPS data indicates that it contains about 300 million cubic meters of magma. Additional stations for continuous GPS monitoring will be installed north of Vonarskarð and on Urðarháls within a few days. There are no indications that the intensity of the activity declining. The migration of magma could stop, attended by a gradual reduction in seismic activity. The dike could reach the surface of the crust, starting an eruption. In this scenario, it is most likely that the eruption would be near the northern tip of the dike. This would most likely produce an effusive lava eruption with limited explosive, ash-producing activity. An alternate scenario would be the dike reaching the surface where a significant part, or all, of the fissure is beneath the glacier. This would most likely produce a flood in Jökulsá á Fjöllum and perhaps explosive, ash-producing activity. Other scenarios cannot be excluded. For example, an eruption inside the Bárdarbunga caldera is possible but presently considered to be less likely. Detailed observations from TF-SIF, the Coast Guard Dash 9 were performed in the afternoon of the 23rd of August. The observations revealed that no signs of an ongoing eruption could be detected and it is concluded that a subglacial eruption did not happen. Increased low frequency tremor observed on that day must therefore have a different explanation. 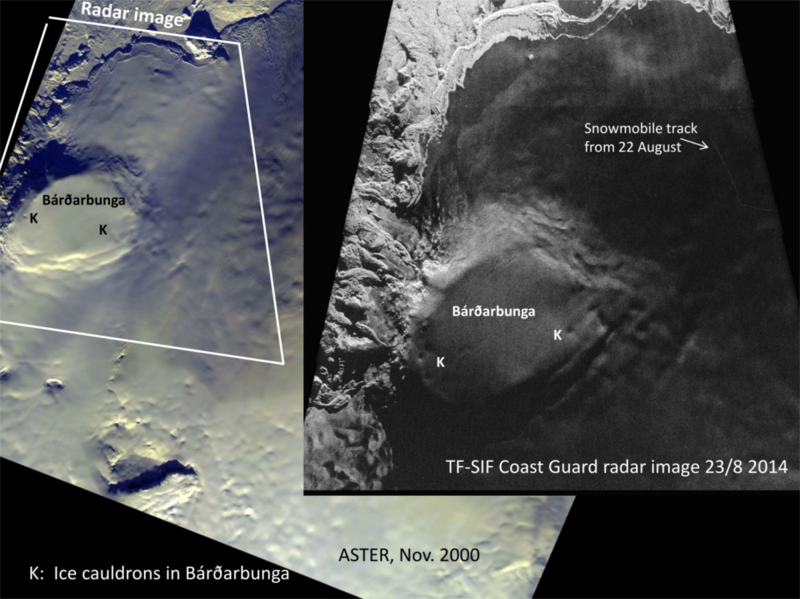 The SAR-radar images obtained by the aircraft in the afternoon of 23 August show that no changes have occurred, neither subsidence, or unusal discharge of rivers. · Large scale melting of ice occurs if an eruption takes place beneath a glacier. Even very small eruptions (like the eruption at Fimmvorðuháls that preceded the Eyjafjallajökull eruption in 2010) if they had taken place under ice, would melt of the order of 100 cubic meters per second of ice and cause notable increase in discharge in glacial rivers. · In most cases meltwater will flow away from the eruption site towards the edge of the glacier. If an eruption occurs in late summer the drainage system at the bottom of the glacier is well developed. This means that water will drain fast to the edge of the glacier. For example, if an eruption site is located under ice, 5-10 km from the edge of the glacier it is expected that meltwater will reach the edge in about an hour. · The time it takes an eruption to melt its way to the surface is strongly dependent on the ice thickness. As an example, the moderate sized eruption of Grímsvötn in 2004, melted through 150 m of ice in about one hour while the more powerful Gjálp eruption in 1996 took 31 hours to melt through 600 m of ice. · The above implies that the meltwater from an eruption beginning under e.g. 500 m of ice in Dyngjujökull would emerge from the glacier several hours before the eruption melts through the glacier sparking off an explosive eruption because of magma-water interaction. 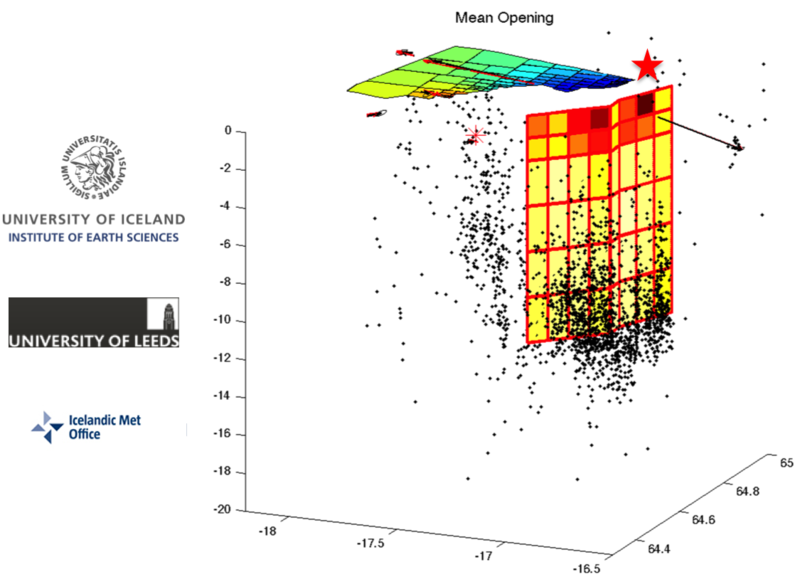 At 11:20 UTC today, seismic tremor measurements gave a strong indication that an eruption beneath Dyngjujökull was occurring. Tremor levels decreased during the afternoon, although intense earthquake activity continues. At 14:00 UTC, an over-flight was made to Bárðarbunga by the Icelandic Coastguard with scientists from the Icelandic Meteorological Office and the University of Iceland, in addition to a representative from the National Commissioner of the Icelandic Police. The over-flight covered the north-western region of the Vatnajökull ice-cap in clear conditions. Both visual observations and radar measurements confirmed no significant changes on the surface of Vatnajökull. Likewise, there were no signs of floodwater draining from the ice margin. During three hours of aerial surveillance, there were no obvious signs of volcanic activity. In light of the intense, ongoing earthquake activity and crustal deformation at Bárðarbunga, the Icelandic Meteorological Office has decided that the aviation colour-code should remain ‘red’, signifying that an eruption is either imminent or in progress. The situation will be reassessed tomorrow morning. 23rd August 2014 14:10 – a small eruption under Dyngjujökull? The Icelandic Coast Guard airplane TF-SIF is flying over the area with representatives from the Civil Protection and experts from the Icelandic Met Office and the Institute of Earth Sciences. Data from the equipment on board is expected later today. Data from radars and web-cameras is being received, showing no signs of changes at the surface. The estimate is that 150-400 meters of ice is above the area. The aviation color code for the Bárðarbunga volcano has been changed from orange to red. Some minutes ago (14:04), an earthquake occurred, estimated 4.5 in magnitude. Since the start of the earthquake swarm, precise continuous GPS stations located in the vicinity of the Bárðarbunga central volcano have shown movements which indicate that magma is propagating in the crust. During the period between 8 am on the 15th of August and 4 pm on the 18th of August a GPS station on Dyngjuháls moved 5,4 cm towards the northwest and a GPS station near Grímsvötn moved 1,8 cm towards the south. 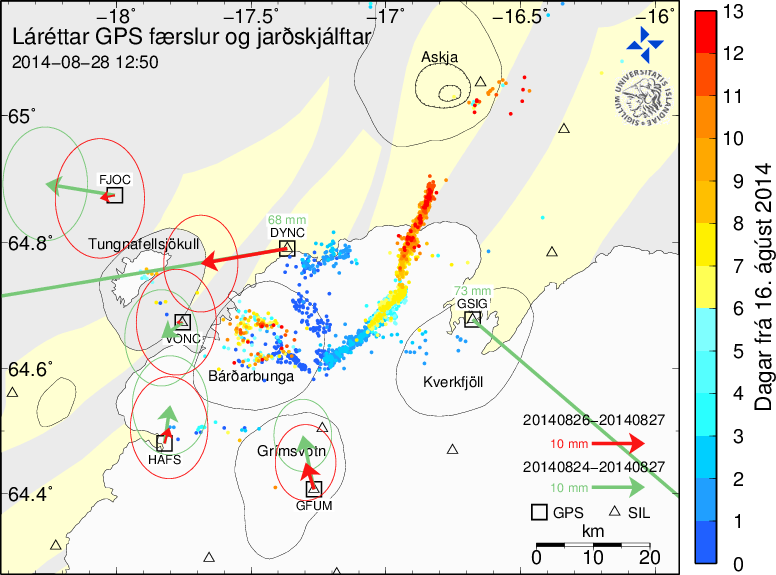 The map shows locations of earthquakes detected by the SIL network of the Icelandic Meteorological Office. Movements on continuous GPS stations are shown as blue arrows, the continuous stations are run in cooperation between the Institute of Earth Sciences at the University of Iceland and by the Icelandic Meteorological Office. Fractures and eruptive fissures in the area are denoted by yellow and red lines respectively. The orange arrows show a model on how the GPS stations could be moving if a dike was propagating (see thick red line on map), and magma was draining away from the Bárðarbunga magma chamber („Mogi center“). It has to be mentioned, however, that this model is only one of several models that can explain the movements seen on the GPS stations. Earthquakes: Icelandic Meteorological Office (part of the earthquakes have not been reviewed). and Páll Einarsson (2012), Ásta Rut Hjartardóttir (2013). Background: IS50 database of the National Land Survey of Iceland. 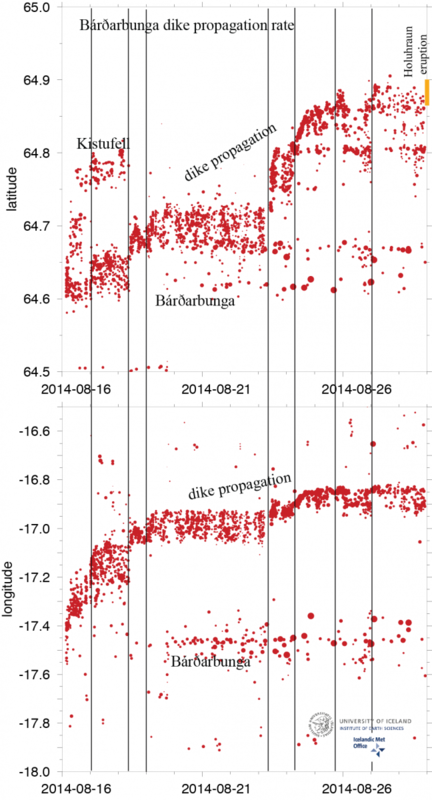 The intense seismic activity that started on 16 of August at Bárðarbunga persists. Very strong indications of ongoing magma movement, in connection with dyke intrusion, is corroborated by GPS measurements. There are currently two swarms: one to the E of Bárðarbunga caldera and one at the edge of Dyngjajökull just E of Kistufell. At 2.37 am on the 18th a strong earthquake (M4) was located in the Kistufell swarm. This is the strongest earthquake measured in the region since 1996. As evidence of magma movement shallower than 10 km implies increased potential of a volcanic eruption, we are moving the Bárðarbunga aviation color code to orange (after a reevaluation of the events in the last days). Presently there are no signs of eruption, but we cannot exclude that the current activity will result in an explosive subglacial eruption, leading to an outburst flood (jökulhlaup) and ash emission. The situation is monitored closely. An intense seismic swarm is currently taking place under the eastern part of Bárðarbunga. Between 03:04 and 13:00 on August 16th a total of 189 earthquakes occurred (max. M2.9). The seismic swarm continues and continuous GPS stations have detected deformation that confirm magma movements associated with intrusive activity. No indications of surface magma extrusion beneath the ice cap have been observed. If the activity progresses towards an eruption, a scenario could involve a subglacial, or partly subglacial eruption, at the northwestern part or edge of Vatnajökull, with a jökulhlaup in the Jökulsá á Fjöllum river towards the north. This is the largest seismic swarm seen in Bárðarbunga since the end of September 1996, in the days leading to the Gjálp eruption. The area is covered by Vatnajökull and the ice thickness varies from 100-200 at the caldera rims of Bárðarbunga to over 800 m within the Bárðarbunga caldera. IMO, IES and Civil Protection are monitoring the situation – the seismic activity can be observed at www.vedur.is. M. T. Gudmundsson, G. Larsen, Á. Höskuldsson and Á. G. Gylfason, 2008. Volcanic hazards in Iceland, Jökull (58), 251-268. Björnsdóttir, Þ. & Einarsson, P., 2013. 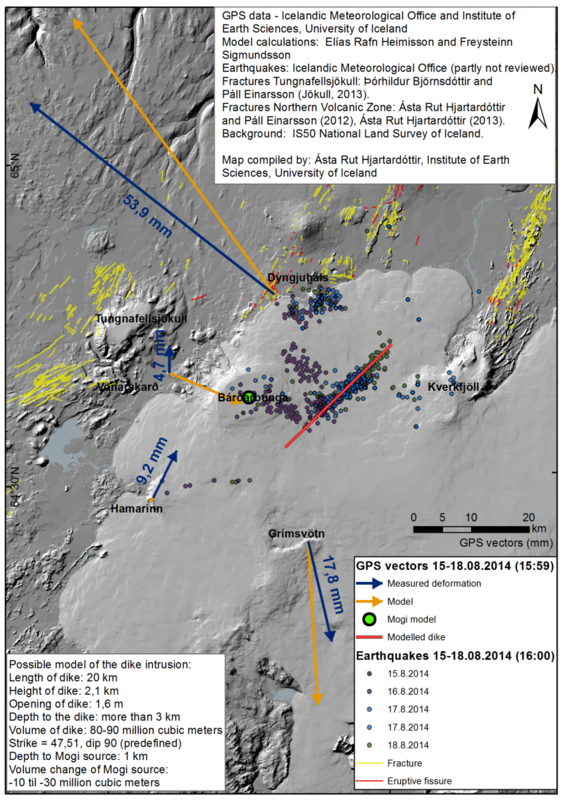 Evidence of recent fault movements in the Tungnafellsjökull fissure swarm in the Central Volcanic Zone, Iceland. Jökull (63), 17-32. Björnsson, H. & Einarsson, P., 1990. 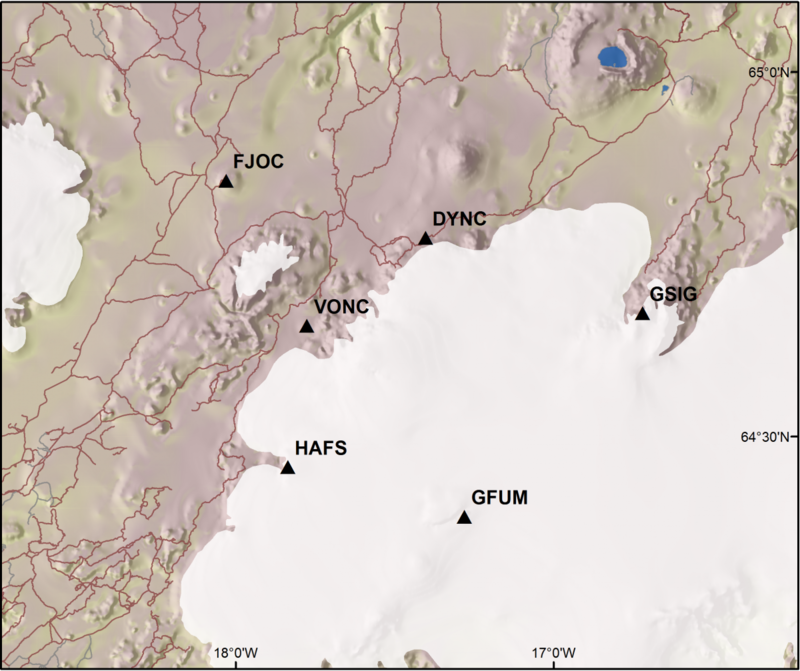 Volcanoes beneath Vatnajökull, Iceland: Evidence from radio echo-sounding, earthquakes and jökulhlaups. Jökull (40), 147-168. Einarsson, P., 1991. Earthquakes and present-day tectonism in Iceland. Tectonophysics, 189, 261-279. Thordarson, T., and G. Larsen, 2007. Volcanism in Iceland in historical time: Volcano types, eruption styles and eruptive history. Journal of Geodynamics, 43, p. 118-152. Pagli, C., and F. Sigmundsson, 2008. Will present day glacier retreat increase volcanic activity? Stress induced by recent glacier retreat and its effect on magmatism at the Vatnajökull ice cap, Iceland. Geophys. Res. Lett., 35, L09304, doi:10.1029/2008GL033510.